Metal Railings Spraying Epsom Surrey. 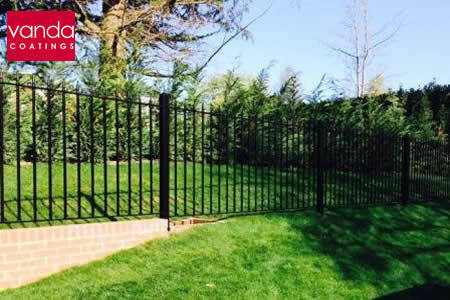 Metal railing spraying is one of our specialties and Vanda Coatings electrostatically paint sprayed an entrance gate and the railings around the perimeter of grounds in Epsom, Surrey. Masking off areas that should not be coated is an important part of any project and in this case sheeting covered the grass and walls. The intercom system, locks and linear activators were all also protected with plastic and tape. If the steel had been galvanised a T Wash primer would have been applied. This product can be brushed on to the substrate and wiped over using rags for uniform coverage. Essentially, it etches the surface, so that the next layer of paint adheres to it. However, this newly installed metalwork had already been pre-primed in red lead epoxy primer (known as red oxide) which simply had to be keyed in and de-greased before the top coat was applied. Because lead is a health hazard our team took precautions when abrading this primed surface. There were areas where the primer had chipped off due to knocks when the railings and gate had been transported and then installed, so these sections had to be feathered out and re-primed with a high build primer after adjacent surfaces had been masked off. It is our policy at Vanda Coatings never to use any lead based primers or coatings. All materials we use are as environmentally friendly as possible. Once our team were happy with the priming repairs, the next stage was to key the surface to make sure the top coat would not come off. Every metal surface was rubbed down from all possible angles and then de-greased to remove any dirt from the smooth substrate. This is so that an even layer of top-coat can be spray applied. The electrostatic technique of spray applying the paint was chosen because the coating wraps around the surface. This makes it ideal for metal railings spraying and any intricate metalwork.